When I turned down my parents’ Tiger Mom-like ambitions in favor of journalism years ago, the technology and media industries were worlds apart. The best-known tech companies of my parents’ generation were plodding giants. Take Your Daughter to Work Day was kind of like this video of Conan O’Brien visiting Intel. Drab, gray cubicles. Rows of thousands of people staring endlessly into glowing black screens with command-line interfaces. It seemed draining and bureaucratic. At the time, many news organizations could still afford to have foreign correspondents. I admired reporters like Anthony Shadid, who is writing from Cairo this week with a historical perspective, eloquence and empathy that few in the Western world can match. Today, the worlds have switched places. Jobs like Shadid’s have all but disappeared. Now reporters are the ones who must stare into screens, hunting the confines of Tweetdeck or Quora for an extra nugget of insight or a quick hit that can meet their pageview goals. On Quora, the community is interviewing itself. Real entrepreneurs, investors and engineers like Marc Andreessen are sharing the fruits of knowledge that they have worked so hard for years to obtain. Their answers are thoughtful and detailed. Unlike the blogosphere, they are calm, not hysterical. Companies that leverage the content their users create are getting better every year, while thinning profit margins are undermining the ability of paid media professionals to produce quality work. What purpose does a paid “interviewer” or journalist have in mediating a conversation if a system like Quora can do it better? It’s complicated. I don’t have all the answers. But I’d like to share a framework for how I think about co-existing with user-generated content sites as they become more sophisticated every year. In general, there are two often-conflicting end goals that media businesses must pursue — scale and authority. All media properties make trade-offs between the two as they try to bring new readers in the door while hopefully getting them to move up to other products or paid experiences. Each business optimizes for the best mix as it feels around for a local maximum along the curve. To find it, you must be the best brand for a given community, whether they are French cooking enthusiasts, lobbyists or Silicon Valley angel investors. If you are not, switching costs are zero, so readers will go to somewhere else. So if you are not the best grocery store in the neighborhood, you must be the best organic one or the best Asian one. The tech media ecosystem sustains dozens of pro-blogger businesses along this spectrum. TechCrunch positions itself as the most authoritative and widely-read source on consumer Internet startups. Mashable goes for more scale by positioning itself as a gateway between mainstream technology enthusiasts and the industry, even if it isn’t read as obsessively by insiders. There are also plenty of profitable, very tightly-focused niche businesses like Danny Sullivan’s SearchEngineLand. The prototypical tech blog model usually involves some mix of advertising, sponsorships, conferences and sometimes research. If you serve a small and tightly-knit community, a savvy business person can listen and figure out other ways of making money. Events! Cookbooks! Data! Lolcat T-shirts! Affiliate revenues on relevant products! Donations! Really, anything but advertising. Below are a few example models. 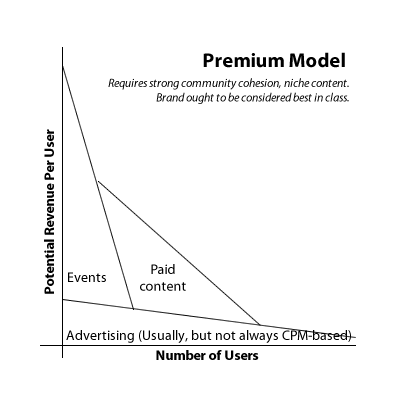 It’s not rocket science: it’s either advertising at scale or freemium (e.g. making a little off all users through ads, but then getting a minority of them to move up to paid products, events or donations.) There isn’t really a right way. There are only different editorial tastes and revenue mixes. Certain niche businesses aligned with high-margin industries are very lucrative – especially if you work in communities where members are actually incentivized to misinform each other. 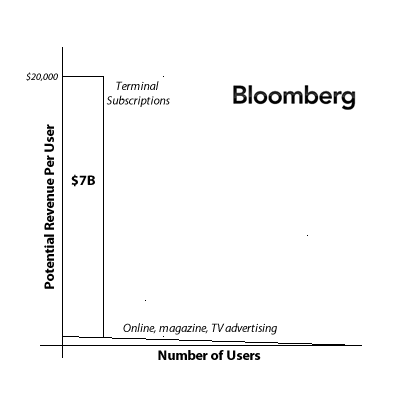 Bloomberg doesn’t really make much from its TV stations or its websites. But it caters to more than 300,000 customers who pay roughly $2,000 per month for a one-size-fits-all terminal subscription. The company brings in somewhere between $6 and $7 billion in revenue, or roughly one-fourth of what the entire U.S. newspaper industry brought in last year. Even online media companies that emerged in mid-2000s to disrupt old-guard properties with free content are starting to charge for their work. GigaOm and Politico both launched pro versions in the last year. It turns out that people are willing to pay for the privilege of not having to wade through 300 blog posts to figure out the actual state of 4G. When GigaOm raised its most recent round of $2.5 million, it said it had 10,000 subscribers. At $200 per year, that’s potentially $2 million in annualized revenue. GigaOm is essentially giving its users the choice of paying with their time or money — a familiar concept in the social gaming world. Does this support the staff of The New York Times? No. But it does pay for a modestly-sized editorial team. Media businesses of a 2000s-era vintage will probably have more success with subscription products than older companies. They are building and iterating from scratch instead of reskinning mass media-era products for new devices like News Corp.’s The Daily. 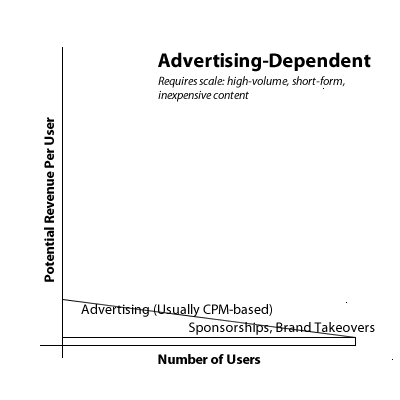 As you venture farther out toward scale, you start to dip into a trough in terms of potential revenue per user. During the mass media era, this used to be where the curve ended and where big brands like Time and USA Today sat from commanding heights. They had almost oligopolistic-pricing power over advertising. They could charge huge premiums for their audiences because they were the only way that brands could reach consumers. New properties like the Huffington Post and Gawker Media emerged to reach large audiences cheaply. However, with hundreds of millions or billions of pageviews per month, even the new businesses must fight declining CPMs. Gawker Media, which has been in business for eight years (which is like 56 in “blog years”), reportedly made only $15 to 20 million last year on 19 million uniques, according to The New Yorker. Huffington Post reportedly did $31 million on 26 million uniques with about 200 employees. Farther into the trough are companies like Demand Media, which has never reported a profit even though CEO Richard Rosenblatt has claimed it has multiple times prior to IPO. It uses a bizarre accounting maneuver to distribute its editorial costs over a five-year period. AOL has a fascinating hybrid play — it has a Demand-like content farm in Seed and niche properties like TechCrunch and Engadget. The problem is that if you’re a media company that goes purely for scale, your community gets too large and unwieldy to upsell into other products. Like any other industry, you get outside of your core competency and create an opening for a competitor to capture your original base. At the same time, you lack the technical prowess that companies like Facebook and Google have in delivering relevant and hyper-personalized information and ads to hundreds of millions of users. Stuck in the middle, you cannot realize the full benefits of either scale or authority. The hope is that the brand advertising dollars that have yet to migrate online will come to these businesses. That may be true, but Facebook may be the conduit should it launch an advertising network. In the meantime, AOL’s advertising dollars are disappearing fast, with fourth-quarter revenue dropping 29 percent to $331.6 million from the same time a year earlier. CEO Tim Armstrong says the turnaround will be visible in the second half of this year. To be fair, I’m not saying media companies in the trough can’t run a profitable business. It’s just that it is neither incredibly lucrative nor does it support interesting journalism. It’s unclear whether The AOL Way, as applied to TechCrunch, will sustain the blog’s reputation once all the earnouts have been awarded three years from now. After the trough, potential revenue per user starts to pick up again. We see pure technology plays that can make sense of billions of status updates, photos, websites or other media that users create themselves. These are the true giants – the advertising-supported consumer Internet companies like Google and Facebook that can reach 600 million to well over 1 billion people. At that level, you achieve true economies of scale. Advertisers who don’t want to deal with thousands of properties work with you. Not only can you serve extremely targeted advertising and information based on people’s search habits, social circles or explicitly-shared interests, new revenue opportunities like virtual currencies, payments or local deals open up. Companies at the end of the curve have symbiotic relationships with everyone else, by referring them traffic or serving as conduits for advertising revenue. Quora, remarkably, has the potential to support authority at scale. Quora is a different breed of company compared to older Web 2.0 startups. The last decade was about lowering barriers to participation. It was about getting people onto the web and getting them to share even the most basic, atomic units of information. But the breakout hits of 2010 were about creating the right mix of incentives to raise quality. If — and it’s a huge if — it successfully expands without undermining quality, it has the opportunity to sit at the end of the curve with hundreds of millions of eyeballs. Its answers might be able to substitute for search, in the same way that South Korean search engine Naver blocked Google out of the local market with its Q-and-A product. It will also have a rich map of people’s interests for targeted advertising. When you consider them together, Quora and other consumer Internet startups break off and own pieces of what professional journalism used to have all to itself. Twitter can substitute as a source for breaking news. Quora captures context and empathy. Techmeme and Hacker News capture curation. YouTube, Flickr and Instagram capture firsthand video and photos. I wouldn’t be surprised if in a few years, startups break their own news with a tweet and a blog post that gets on Techmeme or Hacker News then go on Quora to address follow-up questions. Then there are future startups that will probably rip off Quora’s ideas and support even better interaction. Before you reblog that Quora answer that’s been upvoted 72 times, think about the community you’re trying to build or reach. Think about where you sit along the scale-authority spectrum. If you’re a media company that leans toward scale for profitability, it’s perfectly rational to rehash Quora answers, tweets, press releases or blog posts. It’s inexpensive fodder for pageviews, especially when you do not have the time, resources or incentives to create original work. You can run a profitable business on maximizing pageviews. But you also turn yourself into a dumb pipe. The risk is that in the end, masses of people writing about their passions and expertise (often for free) will commodify masses of low-wage writers churning out 10 posts a day on topics they know little about. If you’re a media company that leans toward authority, being close to your community is your one true advantage. Think about what you can uniquely offer that they are willing to pay for that a content farm, Facebook, Quora or other niche competitor cannot provide now. If Quora corners the market on breathless pontification about tech startups, it’s time to focus on another unaddressed need. There are definitely opportunities. Quora makes it cheap for people to share what they were probably already willing to share. However, a small but significant portion of journalism is about what people are disincentivized to share. Or what is too costly or time-consuming to share. So if you serve mobile developers, and they want a side-by-side comparison of all third-party monetization companies, that’s an opportunity. Or if you know Basque food like it’s nobody’s business, you can sell personal cooking lessons or cookbooks. There are probably plenty of Beltway insiders that might be willing to pay for a blow-by-blow account of how the health care bill is actually being implemented. If you pursue this strategy, don’t ever forget that you are always being commoditized. We live in a strange world. People are willing to pay for virtual corn, but not for a song by their favorite musician. The instant gratification Zynga sells with its digital goods can only be experienced in an environment they control. The value of the digital goods that journalists, writers, filmmakers and musicians sell can be experienced anywhere. You will be copied. I say this not to depict a bleak future filled with dark, Satanic content mills. It’s just that media companies need to build the expectation of constant change into their DNA the way that great technology companies do. Fear in the face of sudden death breeds ingenuity. 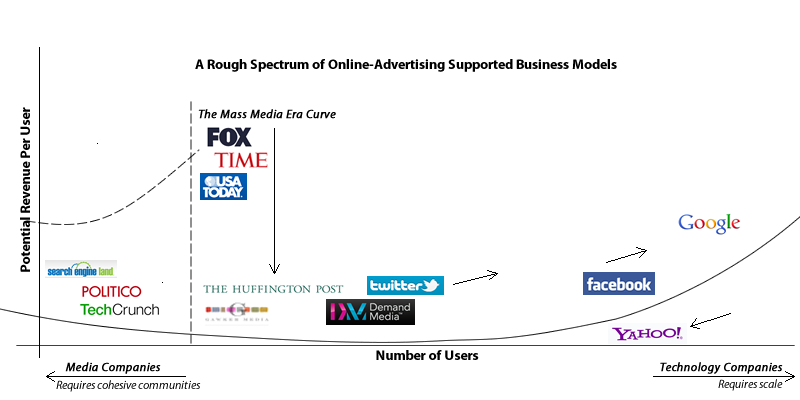 There is no “Mythical Business Model” that will save journalism. Instead, build a culture or a way of doing things that fosters constant adaptation. Apple did not build the iPhone, rake in the revenues and go home. It faces commodification by an army of Androids and so it must always stay one step ahead — ever hungry and foolish. Even though The Huffington Post looks like the animated gif of all news websites, its developers are admirably willing to try anything and everything. Finally, remember your business is about more than content. The Economist does not necessarily sell content. It sells an identity. It sells the assurance that you are a Very Busy, Important Person and that if you pick up a copy of magazine, you will have read everything you need to know this week about other Very Important, Busy People in the world. I’m not sure what the Quora of 2011 or 2012 will look like, but I’ll bet the next generation of startups will have richer tools and social norms that elicit even better work from regular people. Adapting in either the direction of scale or authority entails brutally hard work, whether it involves pumping out 10 stories a day, or having to constantly evolve paid products as others copy you. It’s Joseph Schumpeter’s creative destruction on crack cocaine. Iterate or die. Good luck! Your comment is not readable. Which comment is not readable, Norbert? I am curious. What is this comment? More gibberish. The Bonsai Tree Kits one is spam, the others are pingbacks or trackbacks (or maybe just fatbacks). Your comment doesn’t say anything. What is your comment? Why are you posting gratuitous comment fury, Norbert? That is not polite. This is a very fine post. There was a great deal of hard work that went into it. Most, maybe all, is factually accurate. It neglects to mention the inevitable diluting effect of popularity, cliquishness and favoritism as a factor that diminishes the worth of the Quora scoring system of upvotes or downvotes. That isn’t Quora’s fault, it is a universal aspect of human nature. There are plenty of good answers, and they aren’t hard to find, they just aren’t always at the top of the stack. So Norbert, why don’t you share with us? What’s your opinion, other than a commendable if not productive effort at comment anti-spam enforcement? Great article, and really interesting representation of the various business models. In what you describe, it can be interesting to compare content with a physical product: if you go for mass production, your unit price drops, margin per product too, yet your volume may increase sharply. You only face commodization, and therefore your sustainable advantage reduces when a competitor finds a cheaper way to produce a similar product. Then you need to reduce your inventory, focus more on quality, and increase margin again. Think for example Apple vs Nokia. It seams a bit the same between NYT and HuffPo. 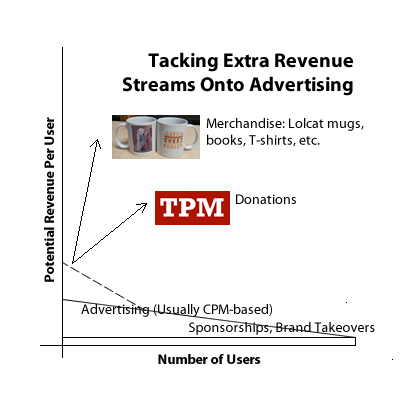 As food for thought, there are models now that allow to monetize content per unit, without impacting your advertising, so somehow you can maintain scale, and progressively build authority. See for example what Cleeng does. Fantastic write-up. The challenges facing traditional journalism and their digital counterparts are unique and volatile. It will be very interesting to see how publishers translate users into dollars without compromising quality or authority. Thanks for sharing – I’ll be passing this on. Hmmm…Apple would be interested in knowing where the $1.1 billion it earned from itunes came from. I’m sure a substantial portion of that was from selling music. As for virtual corn, I’m not willing to pay for it and nobody I know would be willing to either. Regarding The Economist, the reason I read The Economist isn’t because I’m busy and important and want to know what busy and important people are doing. I read it because the articles are interesting, well-written, fact-based and carefully edited. As for “hysterical” blogs, the last time I visited the Huffington Post (ages ago), it was loaded with hysterical and sensationalist content. I’ve seen thoughtful blogs and hysterical blogs, but I know that Huffpo will always be hysterical. I’m not trying to rip you apart. I’m just pointing out that you’ve made some pretty stunning generalizations that are just plain wrong. It appears to me that what you’ve said is that websites are like fads. With all due respect, I just said the same thing in one sentence. Hey Nigel, I’m sorry you feel that way. I just wanted to explain the current state, diversity and tensions of media businesses with a bit more nuance than I typically see. If you wanted something shorter, I can definitely explain my ideas more concisely. Regarding the comments, those are trackbacks. We can take those out. Regarding iTunes, yes, that statement was said with a bit of rhetorical flourish and yes, maybe Apple makes more than a billion from the store. But the volume of virtual goods sold in the U.S. alone is more than $2.1 billion. I don’t think anyone in the traditional media industry could have anticipated this strange shift in spending habits 10 years ago. Regarding the Economist, that idea actually came from someone who oversees the Economist’s digital strategy. Of course they prize great content, but they also think of themselves in terms of the identity they are allowing people to buy. My apologies, I was premature in my earlier comments. You did share, and I am most grateful. It was remiss of me not to read ALL the comments first. At least I read the fine article before commenting, but that is irrelevant to my apology to you. Regarding the virtual corn, obviously you and your friends are not busy tilling the virtual fields. But many others are, else Zynga would not have the multi-zillion dollar valuation that it does. I don’t buy virtual produce either, by the way. I don’t trust Facebook (it will steal your soul and keep it locked up forever in their data center, mark my words). Huffington Post IS hysterical. It reads like a tabloid, but is far worse. The NY Post and Sun and Telegraph UK are honest-to-goodness tabloids, and acknowledge such, and sometimes seem less trashy than Huff-Po. (Charming abbreviation, thank you to whomever suggested it). I still believe that Kim Mai Cutler wrote a very thoughtful and insightful piece, far above the quality level of the blogosphere-at-large. And a quite courteous response to Norbert too! Several strain controls can be operated with all brands of compressors and can come with visible contacts, enough room for wiring with numerous openings and holes. are the easiest to make, taste great and are super inexpensive and healthy. the elements and help with the natural healing process. Japanese males wore loincloth wrapped around their private areas. There’s nothing more beautiful than a gorgeous smile without the old lady yellowish I-drank too-much-Starbucks teeth. February 27 – March 1, 2011 – JA New York Winter Show:. T5000 Treadmill by the treadmill assembly services. They readily suckle one another’s cubs, enabling one to survive when lactation fails or death occurs. action as well. Fact is, if every sales person had that one book alone and mastered its principles, they’d be the best in their chosen field. behind a silver curtain of discretion. might show up this year but it’ll be in Q4. Howdy! This blog post could not be written anny better! Pretty sure he wilol have a good read. Manyy thanks for sharing! that comes from the tailpipe when you start your car. net. Sometimes damage can turn up after a few days so it’s a safety precaution that you must take. as simple as “Gourmet appetizers delivered right to your door. This pattern is steller! You plain make out how to continue a referee amused. ‘tween your wag and your videos, I was all but moved to kickoff my ain blog (well, all but…HaHa!) Terrific business. you conferred it. As well cool down! Wow! In the end I got a website from where I be capable of truly obtain helpful data concerning my study and knowledge. « I don’t use Quora, I play it. You are currently reading On Quora, Journalism and Disintermediation at The Quora Review.